Novoflex iPhone kit makes high quality content from your phone possible. 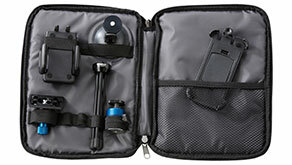 The Kit includes a small Tripod with Ball Head, ball head, Phone holder to attach to any tripod, a suction cup mount, and a great carrying case. With all this gear, you can mount your smart phone nearly anywhere for steady shots!